Officially granted by Royal Warrant in 1906 by King Edward VII. The shield is topped by the Union Jack, representing British Columbia's colonial beginnings. The waving blue and white lines and the setting sun symbolize British Columbia's geographic position between the Rocky Mountains and the Pacific Ocean. The Crest, Supporters and Motto were added to the Shield by Royal Warrant on October 15, 1987, by Her Majesty Queen Elizabeth II. The Crest sits atop the Armorial Bearings of British Columbia and is comprised of the Royal Crest (crowned lion) standing upon the Royal Crown of sovereignty which rests upon a silver and white wreath which, in turn, sits atop a gold helmet. The lion wears a collar of Dogwood flowers, the official flower of British Columbia. The traditional mantle is white and red, Canada's official colours. 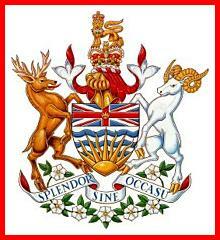 The Supporters, a stag and ram, symbolize the former colonies, Vancouver Island and British Columbia. They stand upon a decorative vine of Dogwood flowers. The Motto, SPLENDOR SINE OCCASU, means 'Splendour Without Diminishment'.